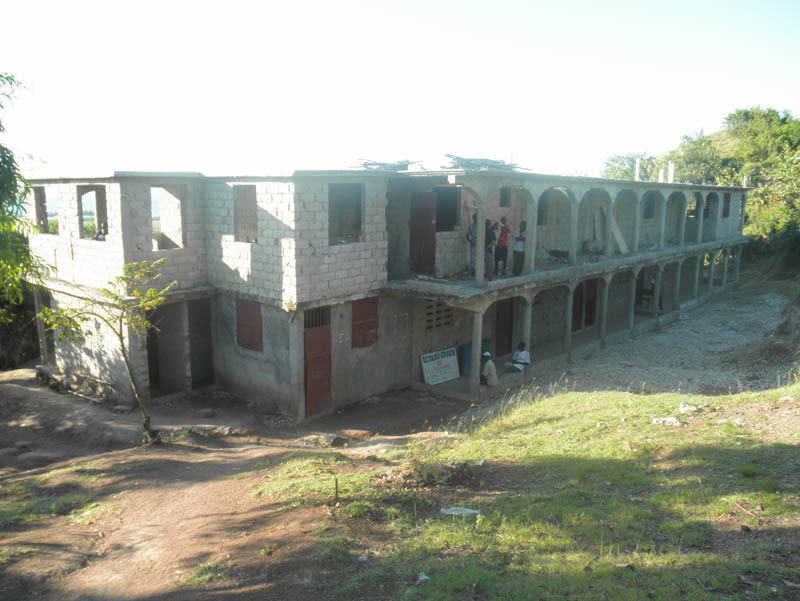 Grace School is located in Grann Plaine, a rural village on the small island of Ile-a-Vache. In December 2012, our installers headed to the island off the coast of Haiti to install a 4 kW off-grid solar energy system. Prior to the installation, the school, the orphanage and the surrounding village had no power. The school, which began under a mango tree in 2007, serves as a lifeline to over 400 children, many of who were orphaned by the 2010 earthquake. In addition to providing a quality education, Grace School also supplies every student with a daily meal. For many, this is their only meal of their day. Solar Liberty Foundation learned about Grace School from Steve Biegner, Executive Director of WNY Impact Foundation. In the fall of 2012, after a year of planning, our team of installers prepared for departure. However, their work was delayed when the container holding the solar panels, batteries and other necessary supplies was held up in Haitian customs. Once released through customs, the container had to be transported via truck to the shore of mainland Haiti, where it was then shuttled over in a tiny boat, piece by piece, to Île-à-Vache. From here, the supplies were pulled by donkeys and carried by volunteers about a mile inland up a rocky terrain. The team worked alongside local electricians to teach them how to install and maintain the battery back-up solar powered system. After three vigorous days of work, the breaker was flipped on and the school erupted in cheers. That night, the children flocked to the school to do homework and every electrical outlet was occupied. As with our other solar electrification projects, this installation provides the village with lighting, refrigeration, internet connectivity and charging stations. Additionally, it powers a water filtration system. Following the installation, Biegner’s group provided the school with computers and iPads. With internet connection, the teachers are able to use their new devices to access an abundance of teaching resources and lesson plans. Access to electricity has also permitted the village to establish the Church of Grace. In March 2013, construction began on the new kindergarten wing at Grace School. Once completed, wires will be buried underground to connect the new wing to the existing solar energy system. Though the system should require minimal maintenance, our relationship with Grace School is only just beginning. Stay tuned, we’ll continue to illuminate the updates!